A function f from set A to set B is a rule of correspondence that assigns to each element x in set A exactly one element y in set B. 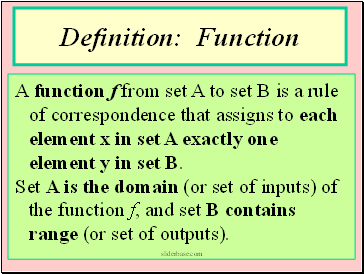 Set A is the domain (or set of inputs) of the function f, and set B contains range (or set of outputs). 1. 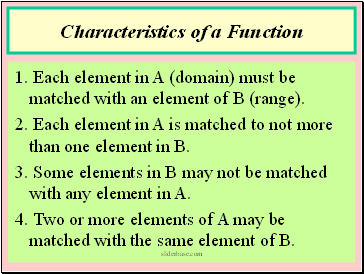 Each element in A (domain) must be matched with an element of B (range). 2. Each element in A is matched to not more than one element in B. 3. Some elements in B may not be matched with any element in A. 4. Two or more elements of A may be matched with the same element of B.
x inside parenthesis is the independent variable. 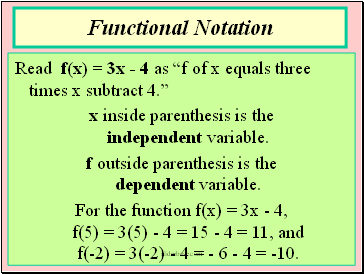 f outside parenthesis is the dependent variable. 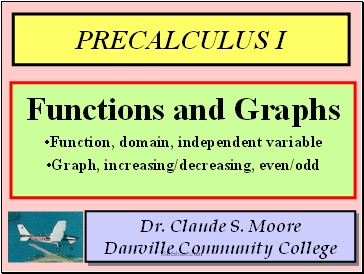 For the function f(x) = 3x - 4, f(5) = 3(5) - 4 = 15 - 4 = 11, and f(-2) = 3(-2) - 4 = - 6 - 4 = -10. 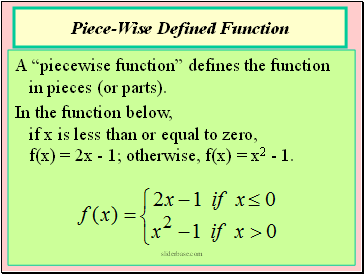 A “piecewise function” defines the function in pieces (or parts). In the function below, if x is less than or equal to zero, f(x) = 2x - 1; otherwise, f(x) = x2 - 1. 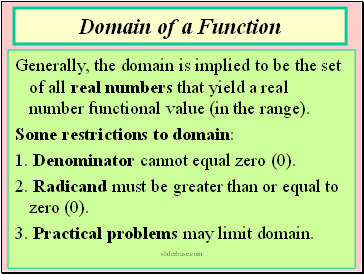 Generally, the domain is implied to be the set of all real numbers that yield a real number functional value (in the range). 1. Denominator cannot equal zero (0). 2. Radicand must be greater than or equal to zero (0). 3. Practical problems may limit domain.